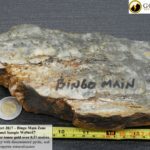 The Bingo property covers 989 Hectares and is only 10 kilometres from the historic Anyox historic mining camp, smelter and power dam located in the Golden Triangle. 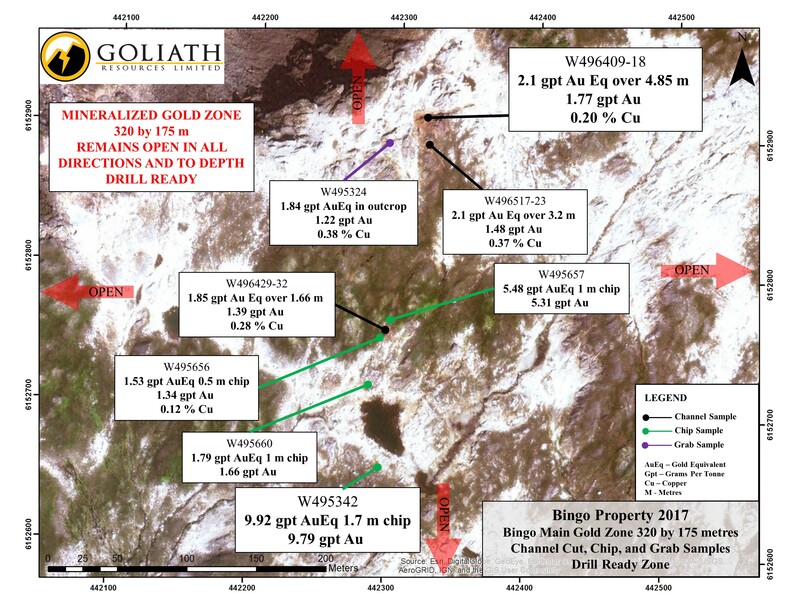 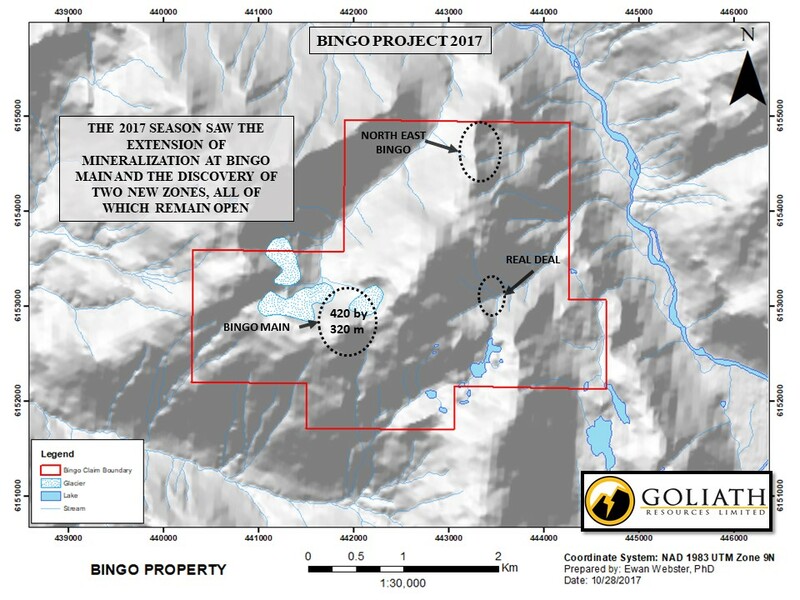 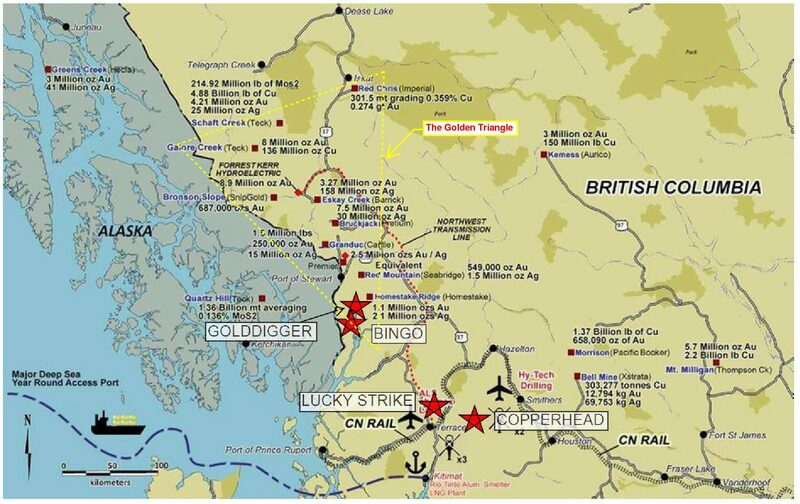 Based on regional mapping, the Bingo property is underlain by Lower Hazelton group volcanic rocks that are in the same stratigraphic unit that hosts Auryn Resources Inc’s Homestake Ridge deposit and Pretium Resources Inc.’s Brucejack deposit. 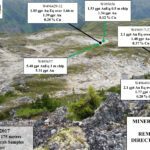 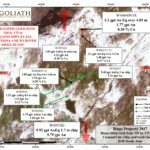 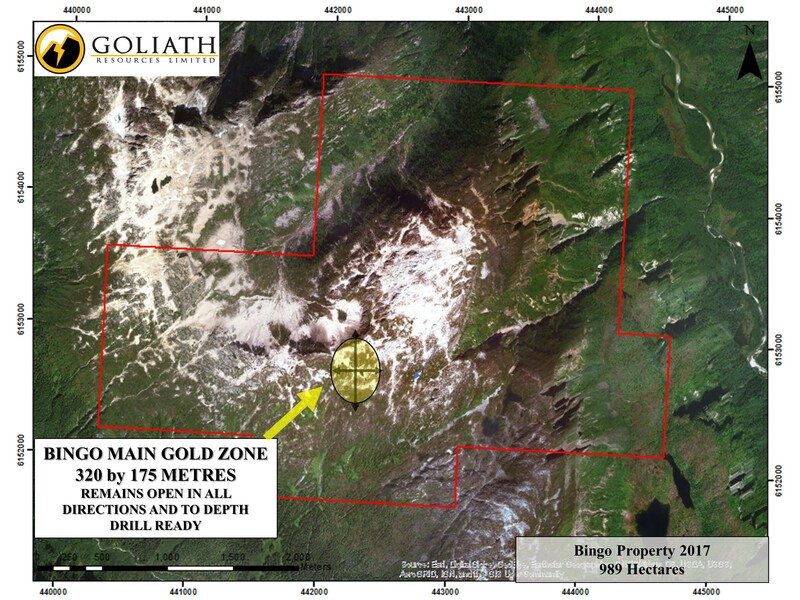 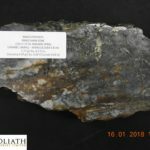 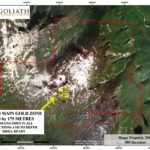 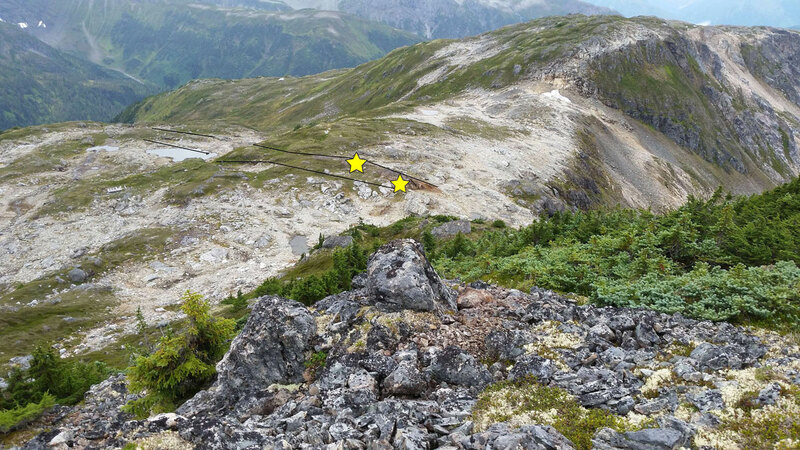 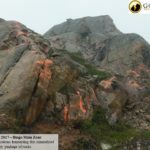 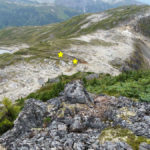 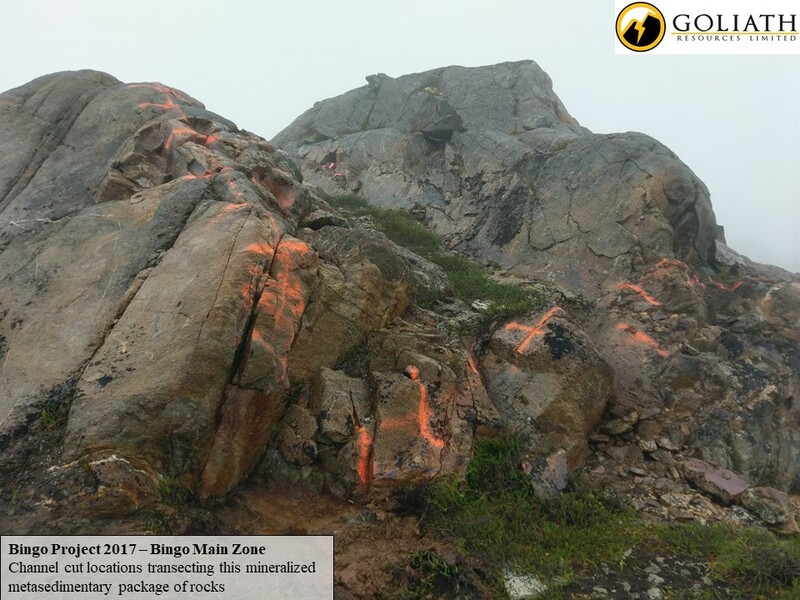 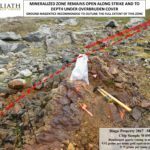 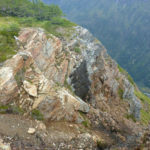 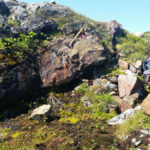 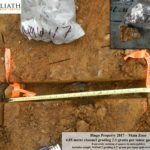 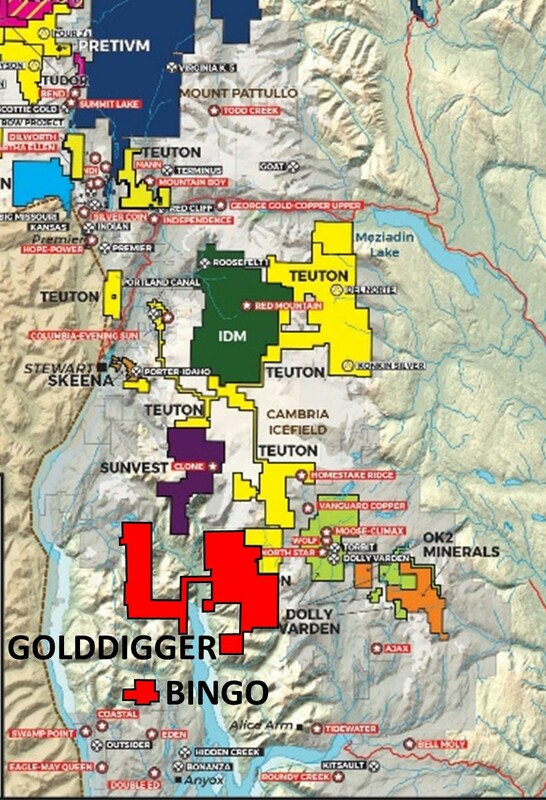 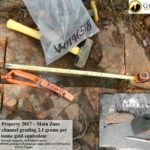 Additionally, the property is located proximal to the unconformity between the Hazelton and Stuhini Group rocks, also known as the “Red Line”, a geological boundary proximal to where many world class deposits are found within the Golden Triangle. 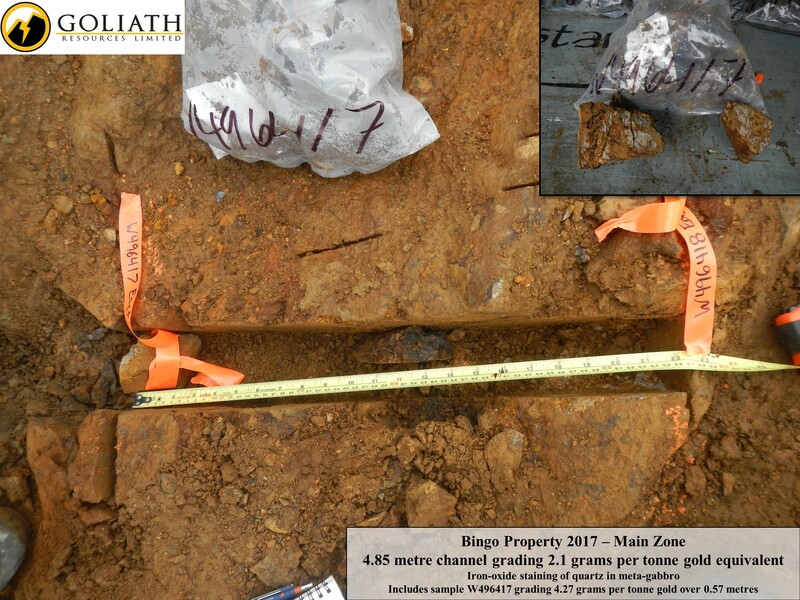 Initial geological observations have confirmed a tremendous untapped potential of this underexplored property. 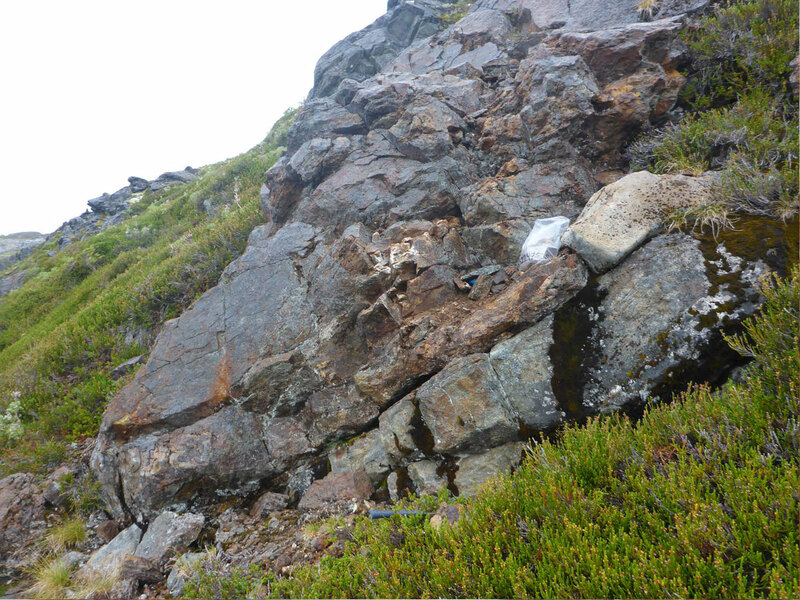 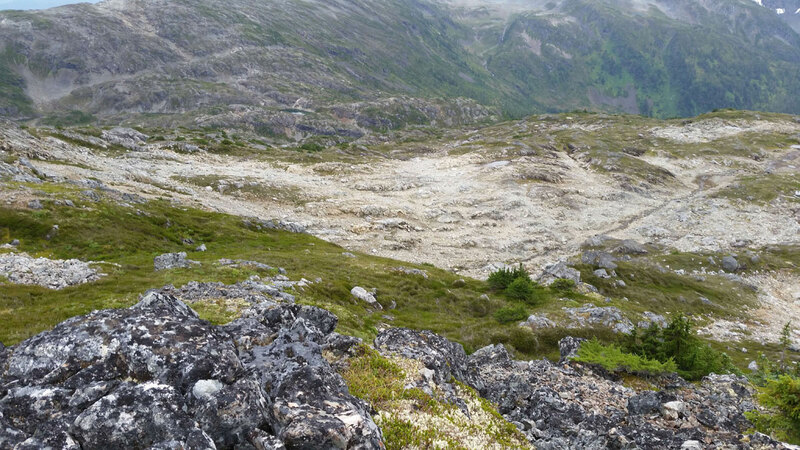 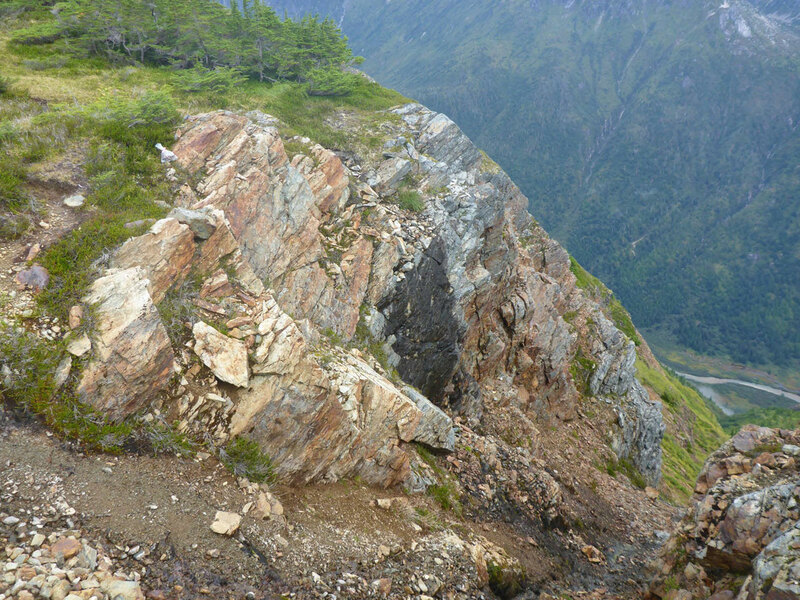 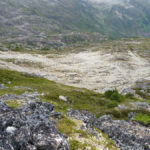 In addition to proximity to the “Red Line”, inter-fingered bimodal volcanics were also observed on the eastern side of the property, similar in appearance to the Iskut River Formation, which hosts the high-grade Eskay Creek deposit. 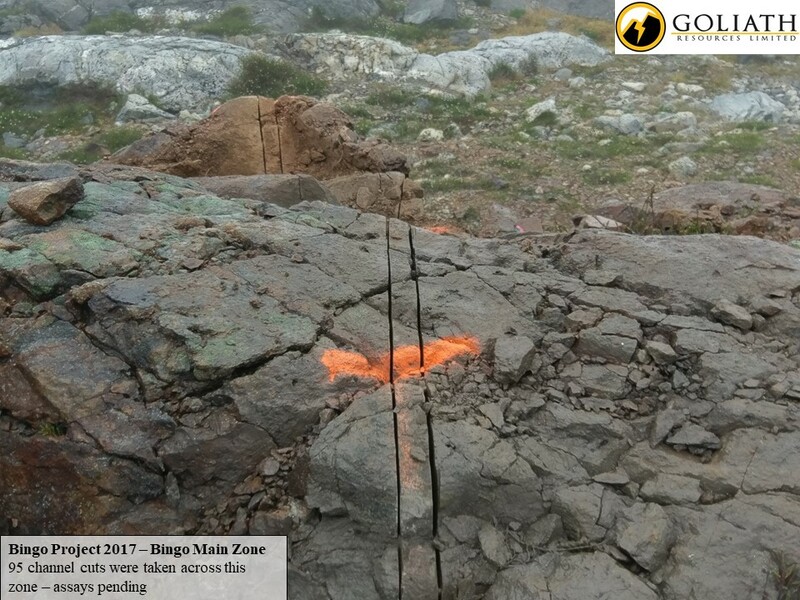 The Bingo Discovery Trend discovery made in 2016 is more than 1 km long and up to 140 metres wide and remains open. 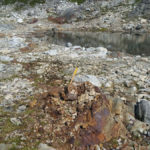 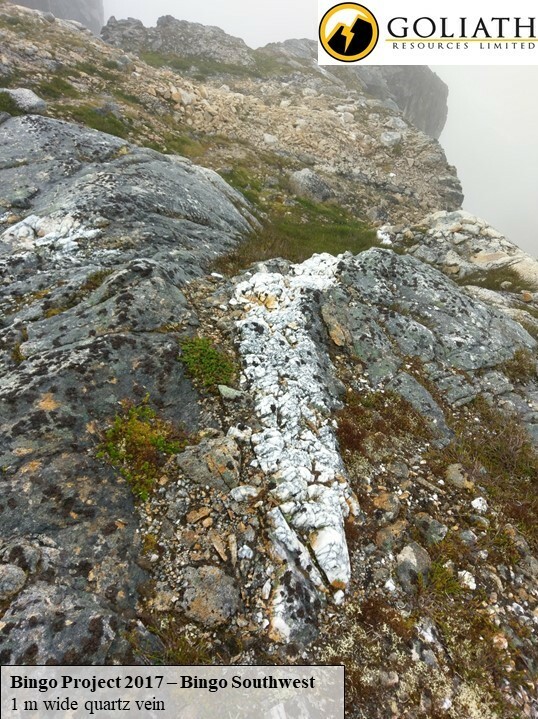 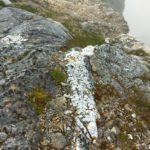 This discovery was made where bedrock has been exposed due to receding snow-pack. 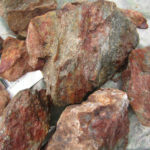 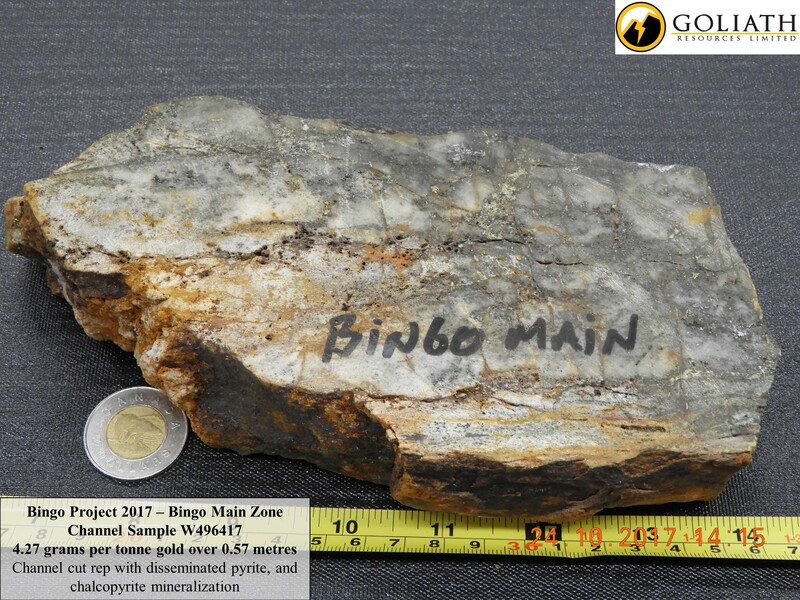 The main Bingo discovery zone, known as the “Main Zone”, comprises gossanous, brown-weathering biotite-rich metasedimentary rocks which dip gently to the southwest and are moderately foliated. 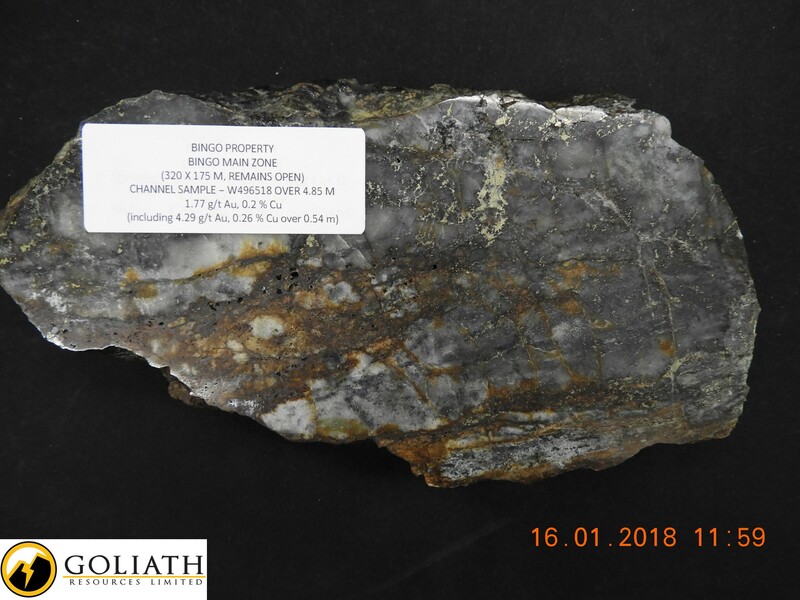 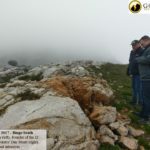 The horizon contains chalcopyrite-pyrite-covellite bearing quartz veins up to 30 centimeters wide as well as localized disseminations of pyrite and chalcopyrite. 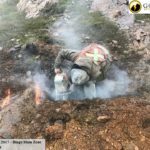 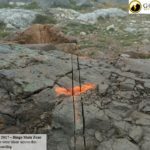 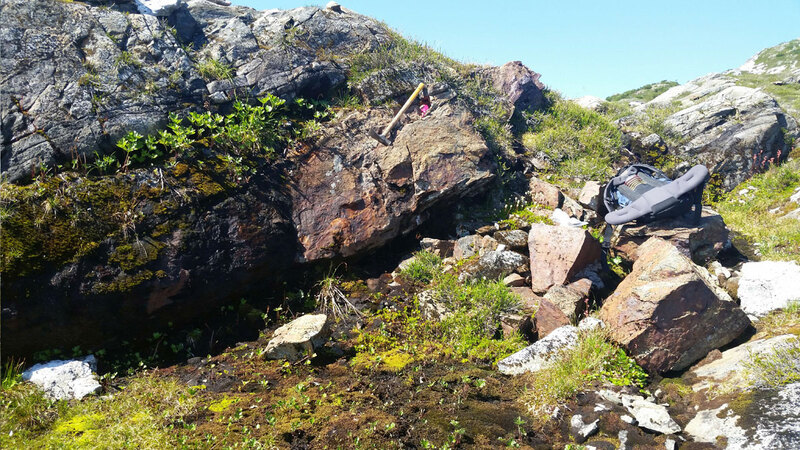 Mapping and prospecting in 2017 expanded the known extent of quartz veins and sulphide occurrences to 420 metres long by 320 metres wide. 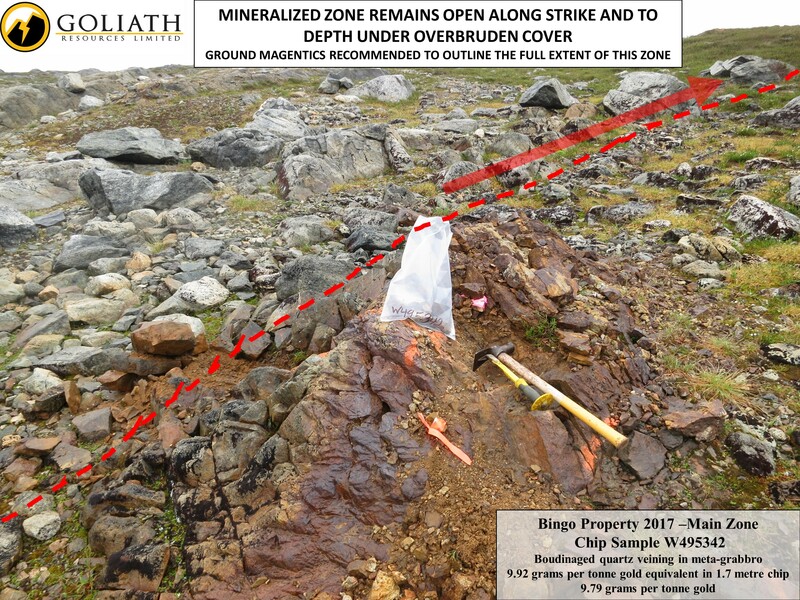 This zone remains open. 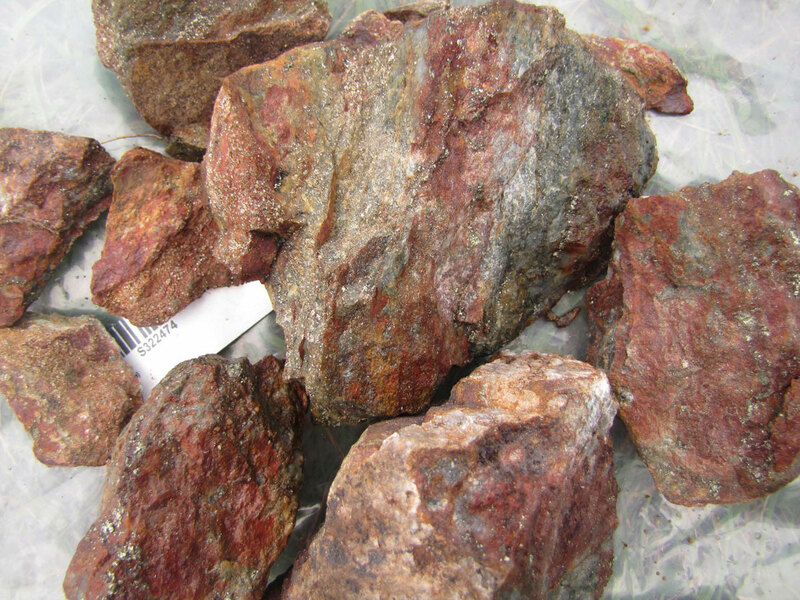 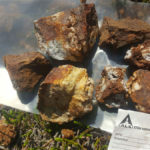 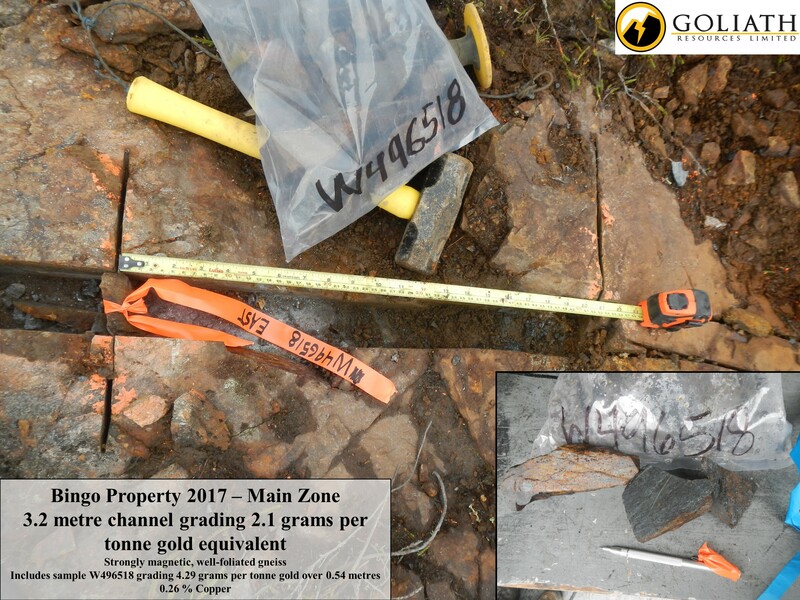 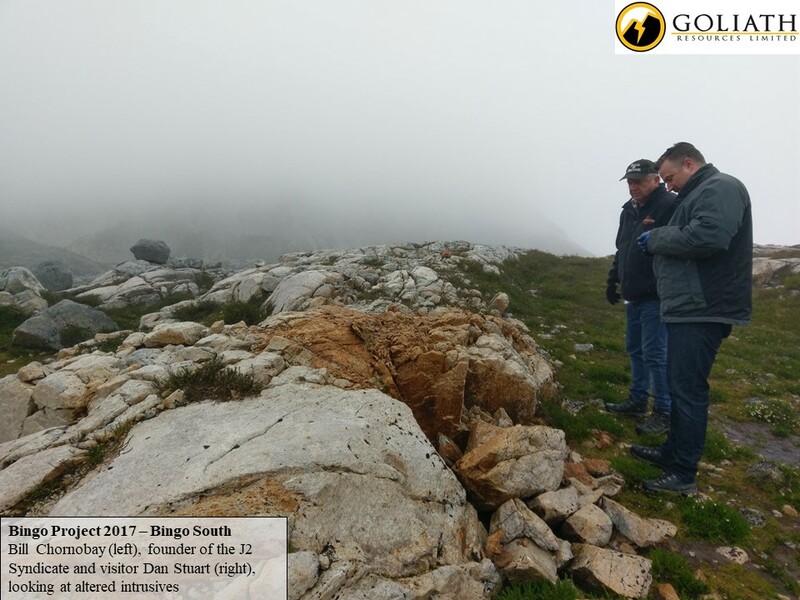 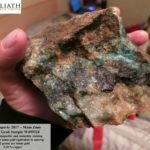 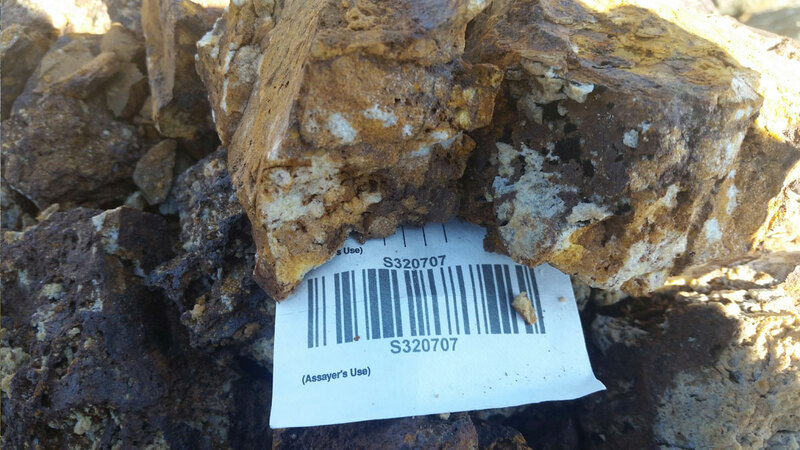 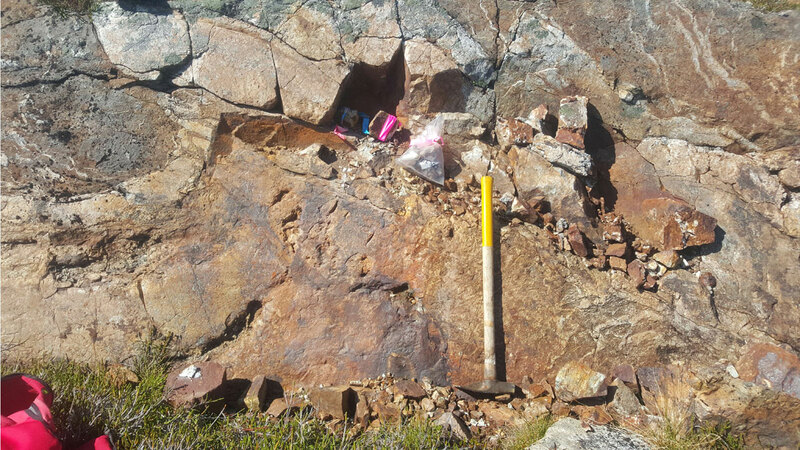 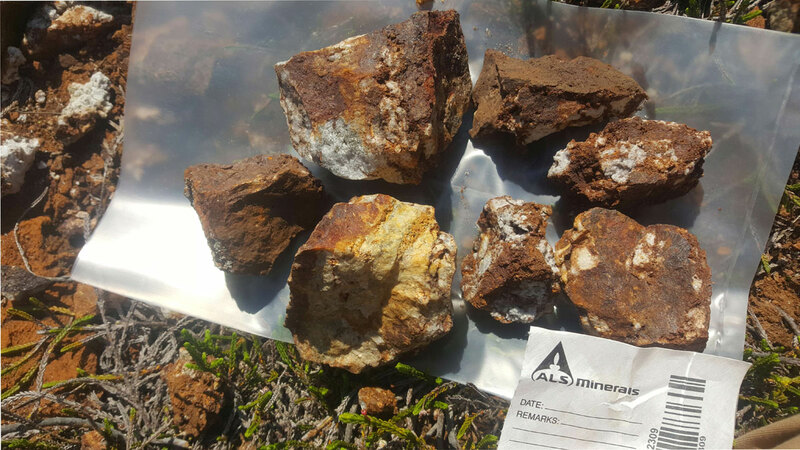 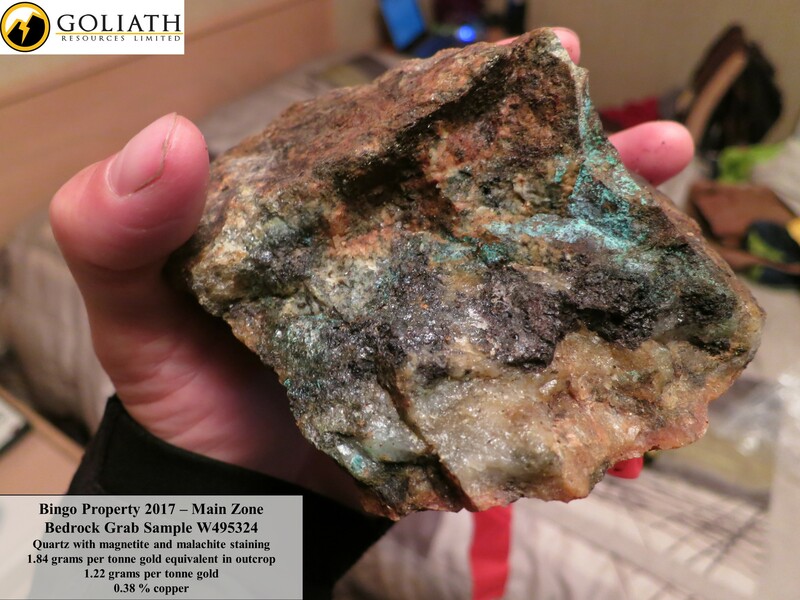 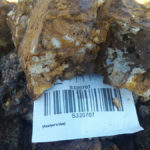 A bedrock grab sample taken in 2016 assayed up to 7.14 grams per tonne Gold and 1.6% Copper. 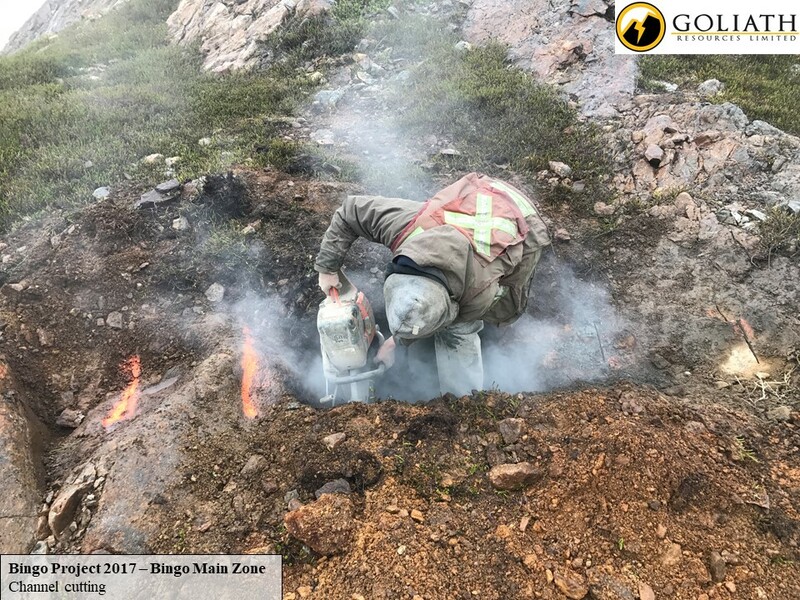 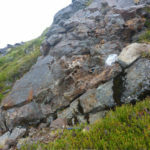 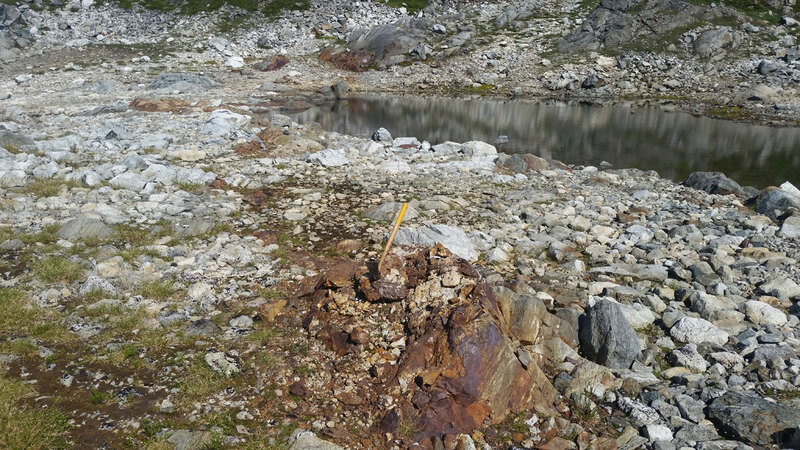 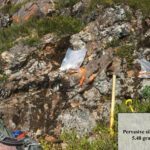 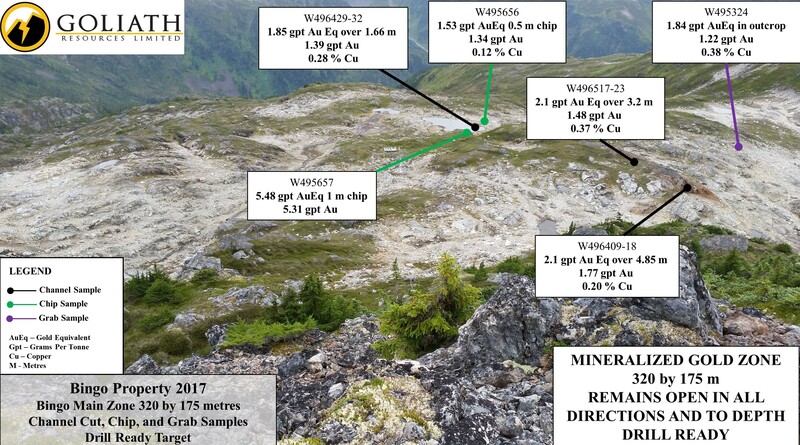 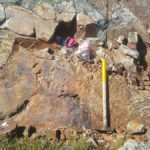 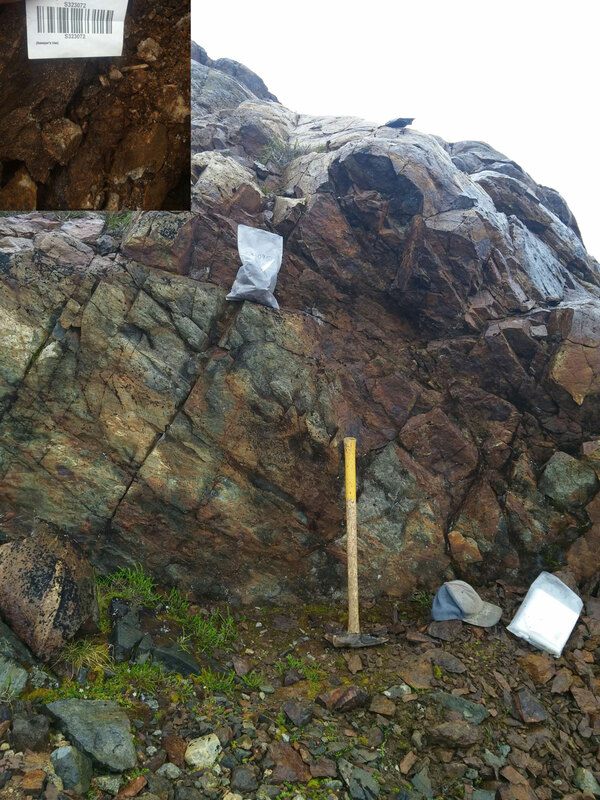 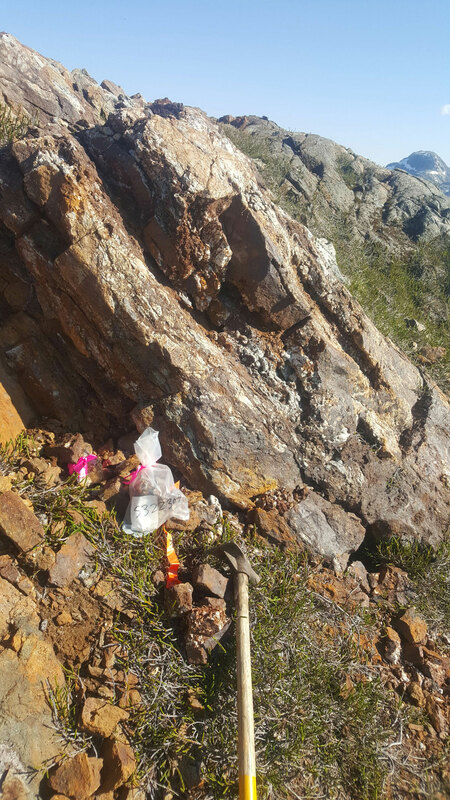 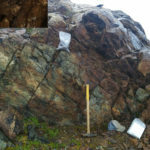 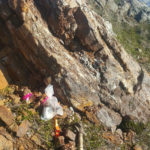 A total of 36 rock samples were taken in 2016 from various mineralized outcrops across the property, of which 15 samples (43%) have returned over 1 grams per ton gold up to 7.14 grams per ton, and 19 samples (54%) have returned over 0.1 percent copper up to 1.6 percent.